Stanley Memorial Library: What’s In a Name? Shortly after stories were published about opposition to the Prince George’s County Memorial Library System’s plan to drop the “Stanley Memorial” name from the new library, Laurel resident Maureen Johnson wrote a letter to the editor of the Laurel Leader, in favor of changing the name. She brought to light an important historical detail that had been readily available in Charles H. Stanley’s online biography, but until now, hadn’t so much as raised an eyebrow: he fought for the Confederacy. She raised the point that it’s not necessarily the fact that a library is named after a Confederate veteran that troubles her; it’s the location of the library that is going to undoubtedly rub many residents the wrong way—Laurel’s historically African-American neighborhood, The Grove. Moreover, the new building will occupy an even larger portion of Emancipation Park than the current building does. It’s crucial that I include this update, because much has changed over the last few days—and it’s in the interest of fairness that I add Maureen’s voice to the story. When I wrote the original post below—and subsequently launched a petition urging the Library Board to keep the Stanley name, it was solely in response to the news that the PGCMLS was planning to drop the name “in order to make the library easier to find”—which I think we can all agree was a universally absurd reason. As far as I was concerned at the time, the only issue at hand was the library’s potential breach of contract with the Stanley family—the descendants of Charles Stanley, who generously donated the land for which a library in his honor was constructed. For whatever reason, it seems that the idea of actually researching the complete life history of Mr. Stanley himself has just never manifested until now. And in the heat of the moment, reading what little information was posted about him, the innocuous mention that he served as a private in the Confederate army admittedly didn’t have anywhere near the emotional effect on me as it did Ms. Johnson; and that resulted in some spirited back-and-forth on Facebook earlier this week. I’m happy to report that I had the chance to meet Maureen in person yesterday, and found her to be a wonderful, engaging lady who’s clearly passionate about her hometown. She’s also acutely aware of the sensitivity of this entire situation, and acknowledges that it’s complicated on so many levels. We discussed my concern that Stanley’s legacy of extensive service to Laurel shouldn’t be tarnished outright without significantly more research. There are snippets emerging of other potentially important and redeeming deeds that Stanley may have done in his lifetime that specifically benefited the African-American community, too—if verifiable, those types of things would certainly have to be taken into consideration, as well. By the same token, should more troubling details surface about his Civil War experience, it needs to come to light for history’s sake, and particularly for the sake of the surrounding community in which his namesake library has stood for nearly half a century. The PGCMLS has a difficult task ahead, and I hope they’ll reach out to the Stanley family—or vice versa—and work together to reach a solution that’s in Laurel’s best interest. We’ve hardly heard the last of this story. In the meantime, the Laurel Leader‘s Luke Lavoie has written the first extensive piece on it, which you can read here. There are plenty of good points within. And if all that isn’t enough library action for you, don’t forget that today, March 8th, is actually the last day that the old building will be open to the public. Stop by and soak it all in, one last time. 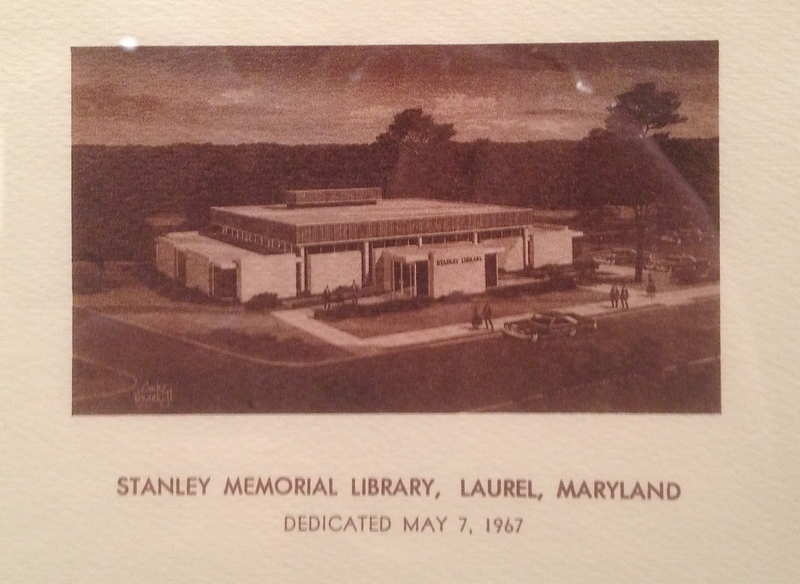 The final week of Laurel’s Stanley Memorial Library is nearly upon us, as the building that opened in 1967 is scheduled to close on March 10th. After next Saturday, March 8th, patrons will have to wait until March 31st for the opening of a temporary facility behind the Municipal Center—as the old building will be demolished and construction set to begin on the town’s brand new facility. The new library will be on the same site, situated at the corner of 7th & Talbott. So while Laurel isn’t technically losing its library, it will be losing the recognizable building that so many have utilized in its nearly 47 years. And that’s the toughest part for me, personally—having worked there as a clerical aide from 1987–97, I’m just not looking forward to seeing the place I knew so well torn down. 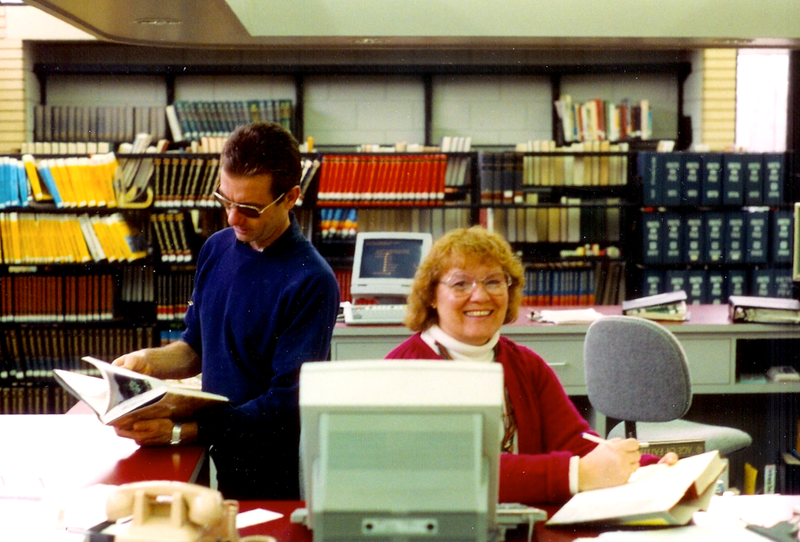 I was part of the staff who, way back in 1993, physically moved every book, shelf, and table around during the expansion. Make no mistake, getting a new library is a very big deal. And it’s good for Laurel. 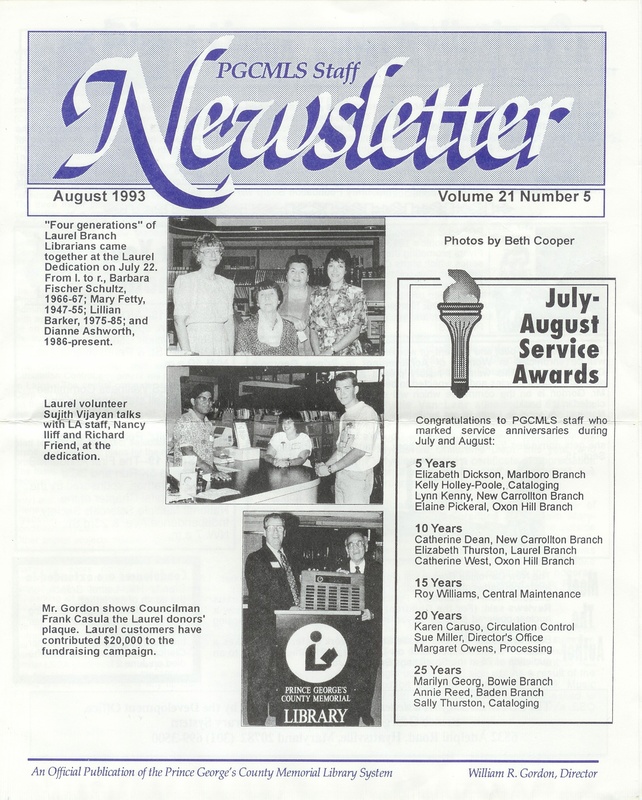 The branch desperately needed the expansion 21 years ago, and has since outgrown that, as well. And this year is shaping up to be one of a renaissance for the town, what with the opening of the new Town Centre at Laurel this Fall, and the library construction. 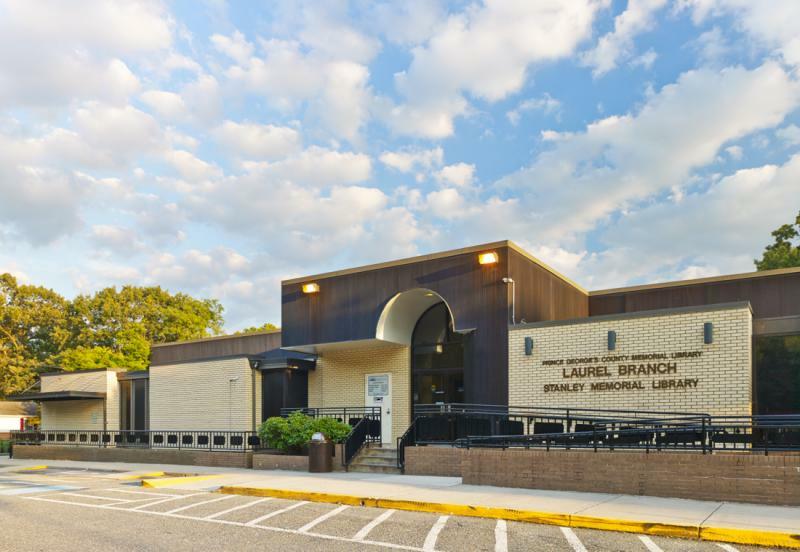 But one of the issues recently being brought to light is the name of the library itself—something that has been a bit blurred over the decades, and something which the Prince George’s County Memorial Library System has done little to clarify. Most of us—myself included, as well as the very librarians and staff who’ve worked there for years—have always referred to the building as “the Laurel Library”. It’s how they answer the phones there, and it’s simply an accepted informal name. In fact, most people don’t even use “Laurel” when referring to it; because if you’re in Laurel and you’re going to “the library”, there’s only one you’re going to. But at the same time, most of us who use these abbreviated names are still conscious of the fact that the building does have a proper name gracing its exterior—the Stanley Memorial Library. And now, for whatever reason, the Prince George’s County Board of Library Trustees is planning to formally drop Stanley’s name from the new building entirely. And they’re doing so under the auspices of “helping the public find the library”—as if A) people in Laurel have forgotten that there’s been a library at this location for nearly half a century, and B) you couldn’t Google directions in a matter of seconds—in this Internet age that has, in effect, almost made libraries obsolete. 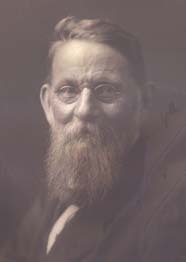 Charles H. Stanley (1842–1913) was the second mayor of Laurel, as well as the founder and president of Citizens National Bank on Main Street. A quick perusal of his biography at the Maryland State Archives will show that he was much more—not only in the Laurel community, but to Prince George’s County and the state of Maryland itself. He lived and died in Laurel, and is buried at Ivy Hill Cemetery—where he could soon be spinning in his grave, should his name be unceremoniously dropped from the library that was always intended to bear his name. She wrote this in a January 22nd response to Laurel Mayor Craig Moe, who had respectfully contested the change. PGCMLS director Kathleen Teaze supported her position in the name of “…(keeping) consistency among the system”—the system, of course, being a simple naming convention based on the branch location. 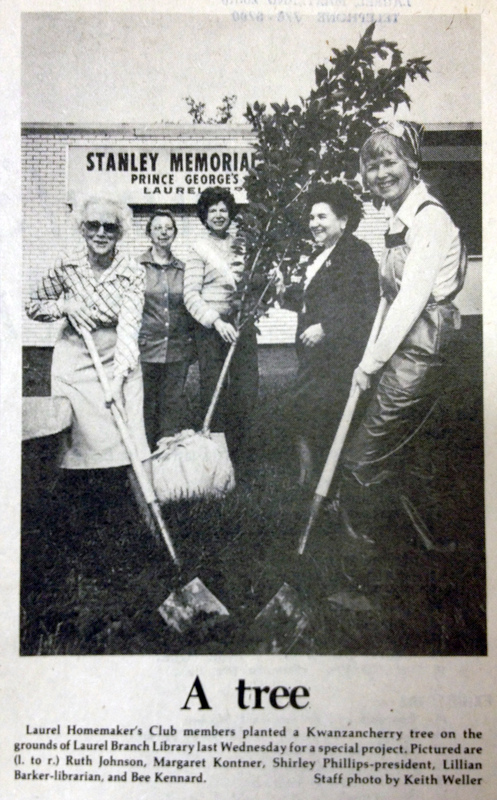 In the 1963 deed transferring the land where the library currently sits, it specifically states that the Board of County Commissioners for Prince George’s County will erect “a Public Library Building to be known as ‘The Stanley Memorial Library’ ” on the land deeded from the Stanley family. That fact alone should be legally ironclad, for as long as any library sits on the parcel of land at the corner of 7th and Talbott. And the Board of Library Trustees’ plan to “commemorate Stanley with a photo and memorial in the library lobby” is an embarrassingly poor compromise, when the man’s name was always intended to be much more prominently associated. I know what some of you are probably thinking. “Who cares, right? It’s just a library.” I’m sure the Stanley family cares, having deeded the land for the library in the first place. Clearly Mayor Moe and the Laurel Historical Society care. I care, and you should care. Most of all, the Prince George’s County Board of Library Trustees had better start caring. What I find most ironic in this is the complete lack of recognition of their own name, the Prince George’s County MEMORIAL Library System. Maybe they should consider changing that, if they’re no longer concerned with memorializing those who made the branches possible. In fairness, I understand to some degree what they’re trying to do. Naming the libraries by location makes perfect sense; and again, people are inherently going to revert to calling them that anyway. It happens with many building dedications, including schools and government facilities. How many DC tourists do you think ask for directions to the “J. Edgar Hoover Building”? They don’t. They say, “Where’s the FBI building?” And that’s fine, because Mr. Hoover’s name is still on it, regardless. If PGCMLS wishes to refer to the new building as the “Laurel Library”, I see no reason why they shouldn’t. The public can refer to it that way, as well. But the new building should nonetheless still prominently bear the name “Stanley Memorial Library”, as its original land deed intended. That part is non-negotiable. And ultimately, it would be no different than it’s always been. I’d like to get back to the Board of Library Trustees’ idea of commemorating Mr. Stanley with a photo and memorial in the lobby for a moment, though. Because while it isn’t appropriate for Mr. Stanley himself in this circumstance, I certainly don’t mean to belittle a lobby tribute—to the right person. In fact, it might be unconventional, but there’s someone in particular I’d really like to see receive that honor. A lot of wonderful people have worked at the Laurel branch since 1967, and sadly, some of them are no longer with us. One such person I’ll forever associate with the library is a gentleman named Tom Acra. Tom had started working at the library straight out of high school himself, and simply kept at it year after year—learning the nuances of the building and caring for it like no one else. He’d been part of the first massive rearrangement of books in 1977, and spearheaded the laborious task again in 1993 when the library expanded. As the years went on and the PGCMLS budget tightened, Tom was utilized even more. I can recall clerical aide hiring freezes that lasted for a year or longer; during which time Tom would help our depleted team by reshelving books and stamping date due cards. More often than not, we never even had to go out to unload the book drop, because Tom had beaten us to it. And it was with the patrons that Tom really connected, ironically. He wasn’t a librarian, or someone you’d expect to be a “people person”, but that’s precisely what he was. In fact, he was a natural at it—and he connected with people of all ages. Kids from the neighboring Grove would occasionally come into the library for a drink from the water fountain and a brief respite from the outside heat, and their voices would inevitably get louder—a bit too loud for a library. Whereas most adults would blow a gasket, Tom had a gentle way of approaching the kids; for one thing, he knew them all by name, and they knew him. And in a matter of seconds, he’d have them quietly perusing a book or magazine, and then happily on their way. Yes, Tom Acra was much more to the Stanley Memorial Library than just a maintenance man. Taking care of the building and its denizens was more than just a job to him. Tom passed away unexpectedly in February 2003 at the age of 50. And when his beloved old library is torn down in the next few weeks, I’m kind of grateful he won’t have to be here to witness it. Continue to honor the legacy of Charles H. Stanley by placing the rightful name, “Stanley Memorial Library” on the new building. If you wish to refer to it within the system as the “Laurel Library”, by all means do so—just as you always have. But please don’t try to remove or relegate his name and think people won’t notice… or mind. If you’re considering honoring someone from the community with a small memorial plaque in the lobby, honor someone who truly did give their all to the library. 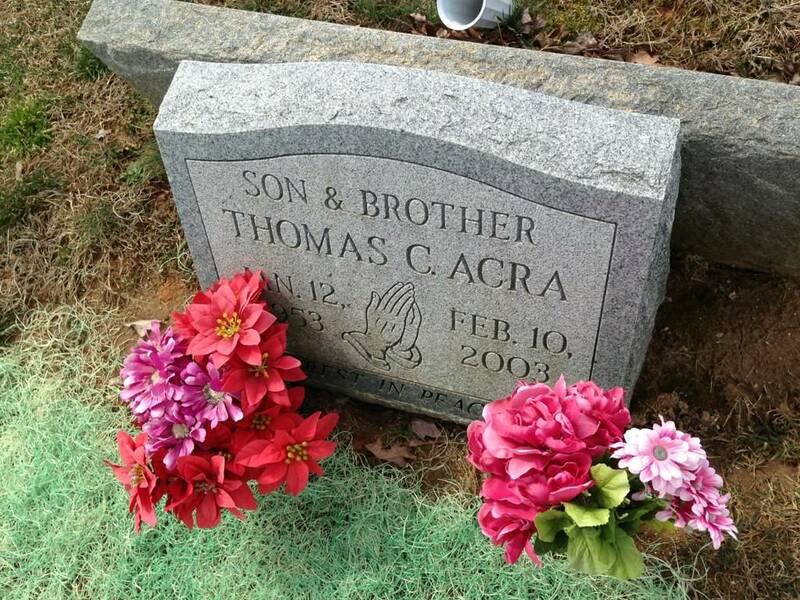 Tom Acra wasn’t a wealthy benefactor or politician, and you won’t readily find his name in books or newspapers; but he certainly invested a lifetime of care and stewardship into our library, and I have no doubt he’d do the same for the new building. I didn’t know him well, but I always wondered what happened to Tom. 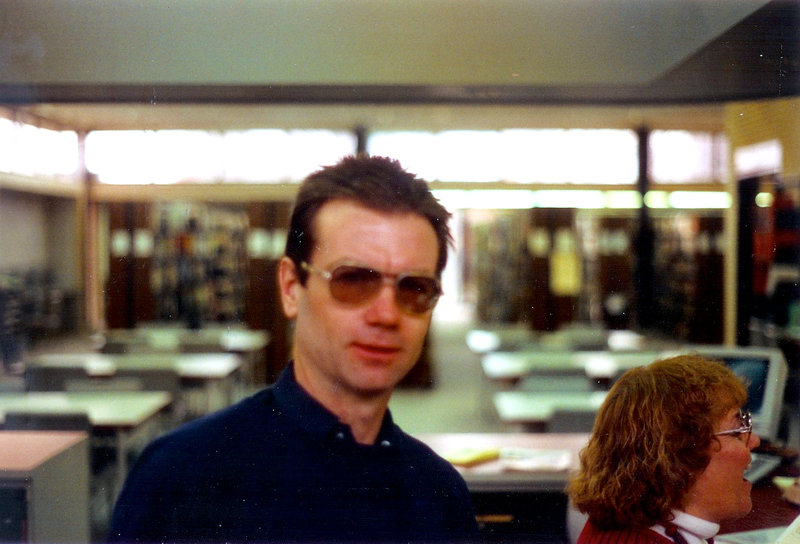 He was the face of the Laurel library for me…for years. Thank you for spear-heading this campaign to keep Stanley Memorial’s name AND for a tribute to Tom in the lobby. Why don’t they rename the library Laurel Library at Stanley Square. The City Council could designate the corner Stanley Sq and have a plaque there to tell everybody who he was. This could accomplish both the goal of location and recognition. is taking the Stanley name off of the library going to make it better, make people smarter, generate more income, be a tourist attraction?? I think not!! Gee it seems like yesterday that library was new and just opening. I remember thinking how fancy and advanced it was. 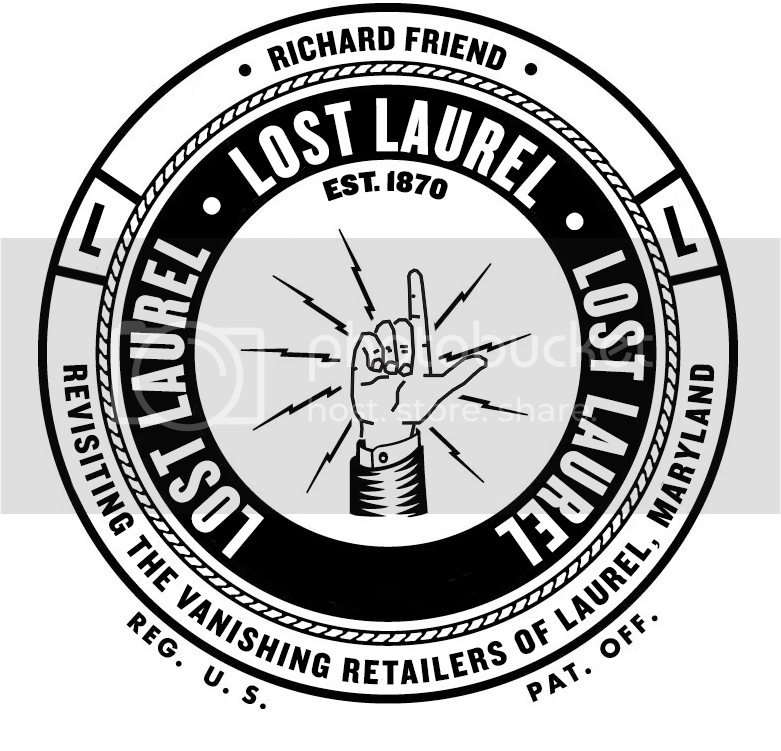 Little by little Laurel has lost and is losing it’s old home town appeal. Such a shame. I understand new is better, but sometimes names should be left unchanged to keep our history in place. Change just for the sake of change accomplishes nothing. Laurel’s history must be preserved as it is. Thank you Richard for your update on the man behind the name of the Laurel Library. The living ancestors of the men and women who built Laurel can not be held accountable for the affairs of the pass. In order to move into the 21st century it is necessary to embrace the past, the history and then make new history with positives moves to get along, share and support all the cultures of this fair city. This can not be done by putting the Charles H Stanley name on the new library in the shadows of Emancipation Park. 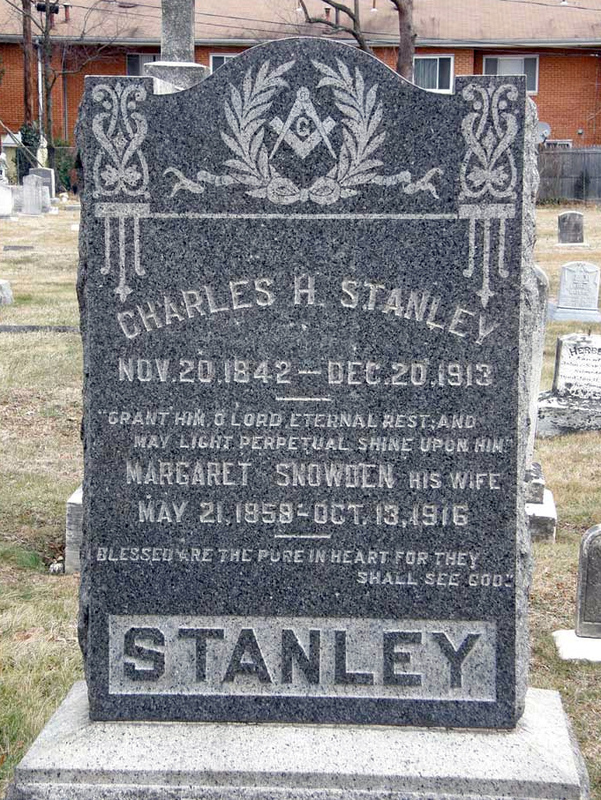 Stanley is not only Charles H Stanley’s name. 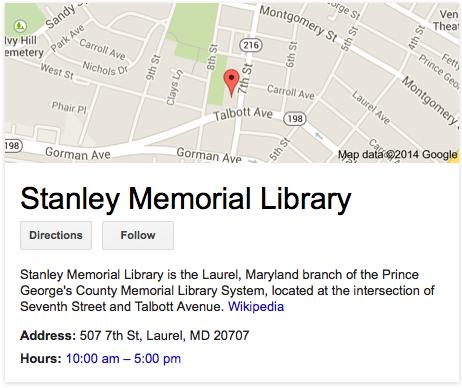 It was never intended to be Charles H. Stanley Memorial Library…..just Stanley Memorial Library. 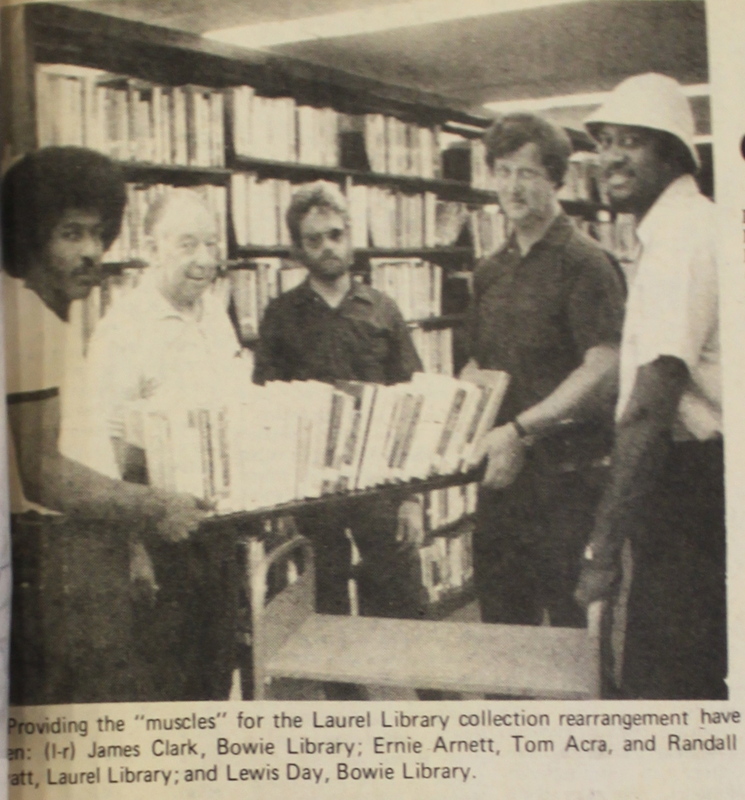 Laurel Library holds a very special spot in my life because I worked there in high school as a page from ~1966 to 1968. It was my first job and I remembered many of the librarians and staff that worked there. I returned there for the first time in over 40 years earlier in 2014 and, despite the changes, recognized many of the inherent shelves and designs inside the library. I have taken members of my family to visit the library for old times sake and it saddens me to see this building being torn down.